You’ve never seen a PC like HP’s Omen X Compact Desktop. It’s a powerful gaming rig, and it’s small enough to do double duty as a pseudo console under your TV. But it also has a built-in battery. And when attached to HP’s revamped VR backpack accessory and its mixed reality headset, you can experience high-end virtual reality in a completely new and freeing way. The only problem? The entire package will cost you close to $3,500. That puts it far out of reach for the vast majority of gamers, even those who don’t mind shelling out for the latest hardware. HP’s Omen X Compact Desktop is expensive, but it’s an ingenious gaming device. It can handle all of your PC gaming needs, but you can also throw it in a backpack for lan parties, or place it right alongside your game consoles. 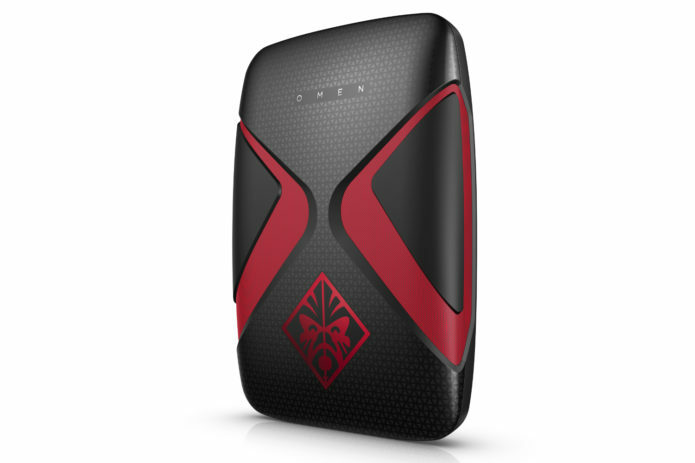 True to its name, the Omen X Compact Desktop is sleek and relatively portable. On its own, it weighs 5.5lbs — lighter than popular gaming notebooks from Alienware and Razer. The desktop also shares the same aesthetic as HP’s Omen 15 and Omen X laptops. It’s got a sharp, angular design with a stylish black case and red accents. It makes a statement on its own, but it really shines when you place it in the bundled dock, which turns it into a monument to PC gaming. The dock gives you an easy way to connect the desktop to your workspace, and quickly remove it, without having to deal with plugging in cables. The front features two USB 3.0 ports, as well as USB-C. While the back has another 3 USB connections, an ethernet jack, as well as DisplayPort and HDMI. There’s also a power connection for recharging the batteries from HP’s VR backpack. The compact desktop, meanwhile, has two USB ports up top, USB-C, HDMI, MiniDisplayPort, a headphone jack, and, conveniently enough, a power connection for the HTC Vive headset. On top of that, there are also two USB ports along the lower side of the desktop. There’s no SD card slot on the the computer or its dock, which seems like a surprising omission for such a fully featured setup. As for HP’s Mixed Reality headset, it’s in line with what we’ve seen from other Windows VR gear. It’s relatively light and, most importantly, easy to put on and take off. There’s a liberal amount of padding around the face area and head band, which insures a comfortable fit. There also aren’t too many straps to mess with: you just loosen the headband with a rear dial, and tighten it once you’ve put it on. Thankfully, you can flip the visor portion up, allowing you to see the real world without removing the entire devices. That’s one of the more useful features we’ve seen from Mixed Reality devices. Each of the headset’s lenses features a 1,440 by 1,440 resolution at 90Hz — the same specs we’ve seen on most Windows Mixed Reality headsets. There’s a headphone jack along the bottom (you’ll have to supply your own), as well as a short built-in cable. The latter is particularly helpful, since it lets you use a long cable to connect to the dektop normally, but you can also swap it out for a shorter cable to use with the backpack. As you’d expect, HP also includes two mixed reality controllers. Each features a large sensor ring for spatial tracking, as well as a thumbstick, and a trackpad that can also be recognized as four separate buttons. There are also the usual things we see on every VR controller these days: trigger and grab buttons, along with menu and home options. Tying all of these new gaming devices together is HP’s VR backpack, which is meant to let you experience virtual reality without being tied down to a large desktop. It sports padded straps and a plastic panel, which the Compact Desktop slides onto securely. It also has two side holsters for battery packs. HP includes four batteries with the backpack, so you can keep one pair charged while you’re using the other. The Compact Desktop is actually made out of laptop hardware. It’s powered by an Intel Core i7-7820HK CPU, which is unlocked to make it easier to overclock. It also features NVIDIA’s GTX 1080 notebook GPU (overclocked out of the box) with 8GB of video RAM. Additionally, the Compact Desktop packs in 16GB of DDR4 memory and a 1TB SSD. Clearly, HP didn’t skimp on components — this thing can easily take on full-sized gaming rigs. The desktop also has a built-in battery, which lasted 1 hour and 10 minutes while running the PC Mark 8 benchmark. Clearly, it’s not something you’re meant to use unplugged for very long. It’s still convenient though, since it means you can connect the Compact Desktop to the VR backpack accessory, and swap out extra external batteries, without shutting it down. That’s a simple thing you can’t do with other VR backpack systems. In desktop mode, HP’s mixed reality headset was a cinch to set up. All you have to do is plug in an HDMI and USB cable. There aren’t any sensors to install, like with the Oculus Rift and Vive. Everything on Microsoft’s VR platform relies on built-in sensors, instead. When you put on the headset, you’re thrown into the Windows Mixed Reality Portal, which is where all of the VR magic happens. You’ll be asked how you want to use your headset: in walking mode, which replicates the room-scale VR we’ve seen on the HTC Vive, or sitting and standing in place. If you choose the latter, you can immediately start moving around Microsoft’s virtual living room and testing out mixed reality apps. If you want to walk around VR environments, though, you’ll need to clear out nearby furniture and trace a virtual boundary using the headset first. It’s all meant to keep you from bumping into your desk and nearby walls. Compared to the virtual living rooms from Oculus and HTC Vive, which serve as a home base for everything you’re doing in VR, Microsoft’s feels comfortable. And even though there are only 60 virtual reality apps in the Windows Store so far, including notable entries like Superhot and Arizona Sunshine, there’s still plenty to do. Superhot, feels just as smooth and immersive as it did on the HTC Vive. And since the headset is higher res, everything looked sharper as well. Watching trailers in the virtual screening room almost felt like I was in a theater. And it handled 360-degree videos well. The Star Wars Rogue One behind-the-scenes experience felt just as immersive as other headsets. Microsoft also wisely partnered with Valve to bring SteamVR over to Mixed Reality headsets. Steam automatically recognized HP’s model when I started it up, and I was able to hop into Rez Infinite. After playing for a while, though, it’s clear that Microsoft’s VR controllers aren’t nearly as ergonomic as Oculus’s excellent Touch controllers. Hitting the trigger and grip buttons don’t feel very natural, and since they have straight handles, they don’t fit easily into the natural curve of your hands. Hopefully, that’s something Microsoft can fix with its next controllers. When it comes to HP’s backpack accessory, I was honestly surprised how much I enjoyed using it. It made diving into VR more immersive, since I didn’t have to worry about getting tangled in any cables tied to a large desktop. Sure, the setup is a bit more involved: You’ve got to attach the compact desktop, slide in the battery packs, and make sure everything is connected properly. The backpack feels surprisingly comfortable to wear, thanks to its padded shoulder straps and two front straps. The entire setup clocks in at 8.3 pounds, which isn’t much more than what I typically lug around every day in my backpack. While playing Superhot, I was able to dodge bullets and take out bad guys far more easily, since I was free to move and bend in ways I couldn’t with a typical VR setup. Of course, there’s also the danger of hitting a wall and running into furniture. Even if you set up virtual borders, it’s easy to miss those when you’re swept up in the game world. And, oddly enough, you can’t quickly set up new borders in backpack mode — you can only do it in desktop mode with a monitor attached. So while you can conceivably take the entire VR backpack setup anywhere — as I did around our offices — you’re stuck using it without anything to warn you about walls or obstacles. HP claims each pair of batteries adds one hour of juice to the backpack setup, on top of what you get from its built-in power source. In my testing, 15 minutes of gaming typically used up around 10 percent of battery life. (I wasn’t able to stay in VR long enough to drain the batteries completely.) Of course, that timing will depend on what, exactly, you’re doing. Sitting back and watching a video, or just browsing the web, could stretch the battery life longer. But, I can’t help but be a VR backpack sceptic. Wireless VR solutions are already here, and they’re only going to get better over the next year. VR backpacks are already an incredibly niche category, but it won’t be too long until they’re completely unnecessary. If you want to use HP’s headset with the backpack, you’ll also have to pick up a $10 virtual display dongle. That’s due to an issue with Windows, which simply doesn’t spit out an image to mixed reality headsets unless it detects a connected display. While it would make more sense for HP just to include one of those adapters in the box, the company says it’s hoping Microsoft comes up with a software fix instead. Oddly, the backpack setup will work fine with an HTC Vive without that workaround. You’d really need a lot of extra spending money to dive into HP’s VR ecosystem. The compact desktop costs $2,499, while its mixed reality headset is an additional $449. And don’t forget about the backpack, which adds another $499. It’s so costly, that it’s even out of the realm of many early adopters. It’s more suited for developers who want to explore what’s possible with portable VR. There are, of course, other VR backpack options on the market, like those from Zotac and MSI. They’re all bigger and clunkier than HP’s system, but at least they’re not as expensive. Zotac’s VR Go starts at $1,800, and it includes both the desktop and backpack accessory. You’ll still need to add your own headset, though. Ultimately, the Omen X Compact Desktop’s power and unique capabilities helps it stand out from the gaming crowd. HP’s mixed reality headset, meanwhile, is a solid entry into new territory, one that’s bolstered by Microsoft’s growing VR platform. And even though VR backpacks might not be around for long, and they’re certainly not something most people should consider, HP’s entry remains the best one we’ve seen so far.